This old ring is named for its decorative green blossom, but its luster is long since faded. 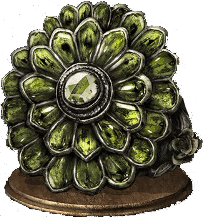 Chloranthy Ring is a Ring in Dark Souls 3. Raises stamina recovery by 7 points per second. +1: Raises stamina recovery speed by 8 points per second. +2: Raises stamina recovery speed by 9 points per second. +3: Raises stamina recovery speed by 11 points per second. Stacks with the Grass Crest Shield and the various Green Blossom items. IDK how idiots think its bad, but what you want is the faster recovery from being in negative stamina, even if youre a god at this game it happens from time to time, and having no stamina means you ded. If I missed it in NG+, will it appear in the same location in NG++? It stacks with Grass Crest Shield, but are there numbers regarding how they go when stacked? Do they just add together, or are there diminishing returns? 11/45 ~ 0.244 ~ 25% = 1/4 = 5/20 increase in stamina regeneration from the +3 version. Powerful for any build. Good in particular to compensate for a small stamina pool. 7/45 ~ 15.6 ~ 15% = 3/20 increase from the +0 isn&apos;t bad either. Yes, I rounded to every fifth integer because I think it is easier to get an idea on how much that is; we don&apos;t see 16% sale in the stores, we see 15%. I forgot to pickup the +1 version before going to NG++, can it be found elsewhere in the game? is it really "good" to boost your stamina regen into oblivion? Kicking "stamina management" into the trashcan? Nothing against using it, we have to if we want to have a fair chance, simple as that. But if a +3 variant should exist in the first place. Anyone else reckon this is just an extended name of "Chloe"
It seems as if the green aura for stamina regen was removed from this ring recently. No more need to remove the ring whenever you are using the obscuring ring. Yay! Useful for recovering stamina to do a dodge if you accidentally go into the negative in pvp and definitely helps lower stamina builds that would rather increase other stats. The ring also lowers the amount of time you can&apos;t regen stamina when your deplete it after an attack. Hell, stamina recovery speed might directly correlate with this, which could be huge. so does it stack with GCS or not,because on the page for GCS it says it does(although the date is older)? chloranthy stack with green blossom? Do not get tricked. This ring is total rubbish. This ring literally does nothing for me. I timed it, and the stamina regen is exactly the same.